Looking to transform the exterior of your home with cladding or render? Cladding your home in a new material is a fool-proof way to completely transform the exterior of the property, increase its kerb appeal and consequently raise its value. Or, if you’re not satisfied with the exterior of your home, and have always loved the clean look of contemporary houses, then a simple rendering could completely transform the look. Alternatively, if you want a traditional look, brick slips or wood cladding could add authentic appeal. Take a look below at what options for cladding and rendering are on the market and find exactly what you need to fit your budget and create the look that you want. Find out more about how to transform the exterior of your home in our practical guide. Do you need planning permission to add exterior finishes? Changes to your home’s exterior appearance may be subject to planning rules set down by your local council – so always check with it first. However, it is possible that cladding changes fall under permitted development. However, this does not apply on listed buildings and on any house on specially protected types of land, within a National Park or AONB – you will need to apply for planning permission in these cases. Which cladding material is best for your home? Your budget, the look of other houses nearby, or what your local council approves will all influence the material you choose for your exterior. Bear in mind that prices vary widely, depending on the intricacies of a particular job, and that many suppliers will only work directly with trade, meaning you may have to hire a building company or architect to achieve the finish you want. You should also consider maintenance. Low-maintenance options tend to have a larger outlay, but think of the money you save on treatments/upkeep over time. If you are a keen DIYer you can save money with a cladding choice that is easy to install and maintain yourself. How much do different exterior finishes cost? Can you install cladding by yourself? A competent DIYer should have no problems fitting timber cladding themselves. This tends to be fitted to battens, screwed to the exterior of the home. PVCu systems can also be fitted on a DIY basis, with some being a click and clip design that is easy to work with. Rendering can also be done by those willing to give it a go. As with plastering and other wet trades, practise makes perfect so you might want to leave it to the pros if you have no prior experience. Specialist cladding and renders are often only available as supply and fit. This may be because the techniques for installation are very specific, and DIY work can invalidate guarantees. Exterior brick slips are lightweight, thin – usually 20-25mm – slices of brick, often fixed to a backing panel with adhesive. Mortar is then inserted into the gaps to create a realistic, pointed look. Ranges include reclaimed and handmade finishes, and you can expect to pay from £50 per square metre including metal lath substructure and mortar joints. Whether in the form of shingles, traditional-style weatherboarding for a classic New England look, timber cladding is a popular choice. There is a wide range, with hardwoods and softwoods, starting at around £10 per square metre for untreated pine, to £50 per square metre for something more durable (including treatment/paint). Wood can be treated to lessen the colour fade that the weather inevitably brings and to improve its thermal properties. Regular maintenance may be required for softwoods, so it is probably worth investing in one of the hardwood options. Render is an excellent wall finish when specified well and used in the right context. Render can be applied to create a smooth, textured or patterned finish, and comes in a wide range of colours. It can help improve your home’s insulation and can be applied to both old and new properties. Consider the type of render you use carefully – lime render will suit old, historic buildings, while new, silicone-based renders are flexible, breathable and low-maintenance. Modern renders are a big improvement on the concrete renders widely used until recently. Prices typically start at just under £60 per square metre. The traditional way to render an external wall is with a sand/cement/lime mix. The problem with these on-site render mixes is that they can vary from plasterer to plasterer. The lime does help with flexibility, so where builders are using simply sand and cement, there is likely to be an issue over time with cracking. Typically people living with a poor render mix experience bubbling, too, and where render is applied to walls with limited direct sunlight (to help dry it out), black mould can appear, along with algae and lime bloom. In addition, the render will need repainting every five years or so. It’s hardly a happy picture, but there is a solution. Over the past decade or so, the addition of silicone into pre-packed render mixes (from the likes of K-Rend and Baumit) has given extra flexibility to the finished render (reducing the likelihood of failure), is through-coloured (meaning no painting) and is largely resistant to moisture. Some of the products are even resistant to pollution and effectively become self-cleaning. The best course of action for you is to talk to your builder about their plan for render, and if they are not considering one of the newer solutions, ask them to look into them for you. 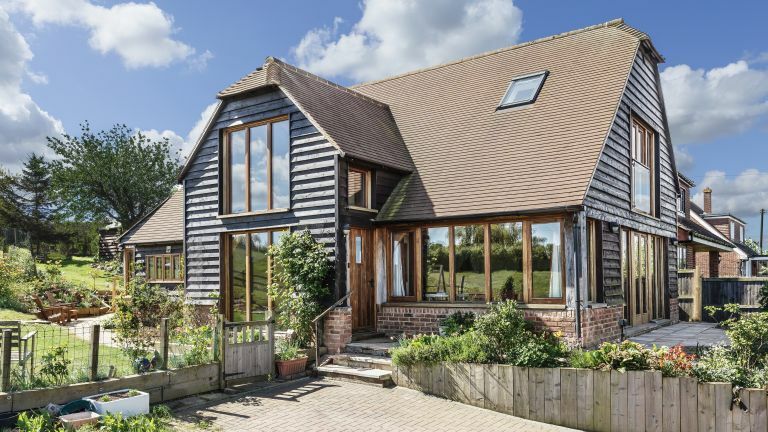 The higher additional cost, particularly on the relatively low surface area of extension walls, is almost certainly worth it in the long term. Find out more about rendering walls in our guide. Use our guide to using lime mortar to find the right render solution for your period home. PVCu cladding, whether is be in the style of larchlap or weatherboarding, is one of the cheapest cladding materials. It is available in both white and coloured finishes, but is prone to discolouration over time. Investing in a high-quality version that comes with a fixed-period discolouration guarantee will ensure you have a durable and maintenance free exterior. Expect to pay around £50 per square metre including fitting. Depending on the material you use, exterior cladding is usually fixed to a house with timber battens or a steel frame, which is attached directly to the structural walls. Applying cladding or render is the perfect opportunity to improve your home’s insulation. Using render to do this tends to be less expensive than using cladding. The cladding you choose may have a rainscreen, which is a breathable weatherproof system that allows water to drain away, reducing the chance of condensation building up behind it. Consider the finished look carefully. Do you need to clad or render the whole house? Treating just the upper or lower half of a property and painting the rest might be sufficient. Before you buy, check the warranties offered by the manufacturer, and that your building insurance provider is happy with your choice of material. Cladding comes untreated, pre-treated, stained or painted, with the unfinished options being the least expensive. Looking for a money-saving option? If you’re an experienced DIYer, you may be able to make a good job of fitting timber cladding or applying textured rendering yourself. Otherwise, look for a firm that offers an installation service.